Bloody Mary Roll: Ra Sushi’s chef’s took all the ingredients that top the RA Bloody Mary (shrimp, bacon, celery, asparagus, tomato, cucumber) rolled in nori and rice and topped with Sriacha mayo. Tamagoyaki: RA’s spin on a Japanese omelet, with bacon fried rice and a soft baked cracked egg; topped with soy butter sauce, green onions and crumbled bacon. Smoked Salmon Tamago Roll: Tamago is a form of Japanese omelet, and RA pairs it with delicious smoked salmon, asparagus and rolls it in nori and rice and top with tobiko, ending up with a fantastic sushi breakfast roll. Premium Bloody Mary: The traditional brunch drink—RA style. They start by infusing our Bloody Mary with wasabi, and then add Ketel One Vodka, Sho Chiku Bai Nigori Sake and crushed cucumber. We’re not even close to done until we drop in a skewer of shrimp, bacon, celery and asparagus, wrapped in cucumber, topped with olives and tomato. Ginger Mimosa: For those who would rather have a fruity drink to start their Sunday our twist on the classic brunch drink is made with ginger orange juice and finishes with sparkling wine. 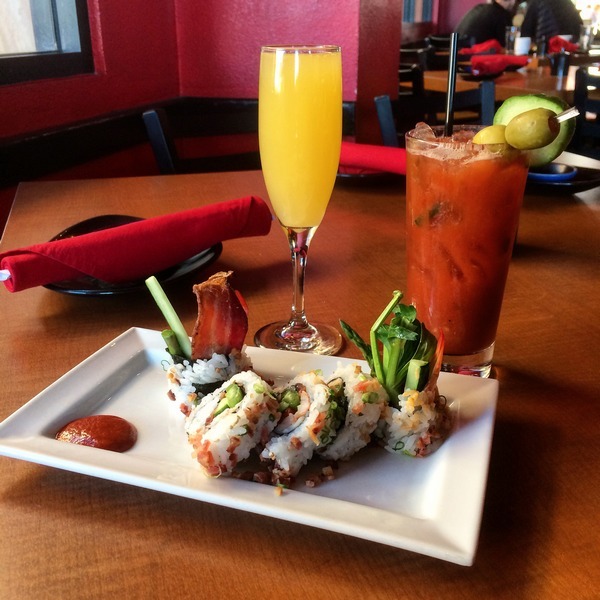 As if 2 rolls of sushi and a piece of nigiri from our Sushi 101 class weren’t enough, we decided to try the Bloody Mary Roll, a Ginger Mimosa, and the Premium Bloody Mary. While the drinks were good, the real stand out was the Bloody Mary Roll. We are always hesitant when trying sushi rolls that are not traditional because typically gimmicky foods aren’t very good. However, the Bloody Mary Roll was fantastic! The flavors were great and each ingredient really stood out. What is really great about Ra Sushi’s brunch menu is that while it has components of a traditional brunch, it is anything but traditional. Brunch is served on Sundays from 11am to 3pm. We’d love hear about your favorite brunch spots! Leave us a comment below with your favorites! *The Geeks were not compensated or given any comped items to facilitate this write-up; Information about the menu items were provided to us, opinions are wholly our own. View our Disclosure Policy for more info.